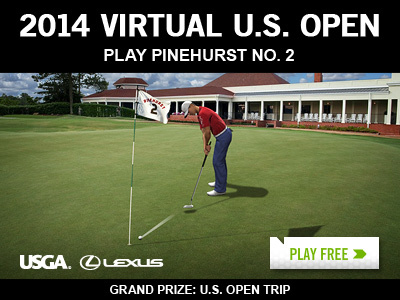 The 2014 Virtual U.S. Open Qualifier ends today June 30th, so post your best round on Pinehurst No. 2 for your chance to win the grand prize trip to next year's U.S. Open. Both the top leaderboard score and one other lucky player chosen at random will each win a grand prize trip for two to Chambers Bay as special guests of the USGA, plus a $500 USGAshop.com gift card. And everyone who enters the Qualifier gets a free USGA avatar, a free Lexus virtual golf ball, and a free Lexus Putter Pal. Attention top players, it appears that the cut line in the Qualifier to make the Championship rounds is 57 or better, as the Top 156 plus ties qualify for the Championship, and about 50 players have posted 56 or better, and over 150 players have posted 57, so if you're close, today is the day to shoot at 57. Good luck! The top-selling Nike RZN virtual golf balls just got vapor trails in matching colors to help trace your shots thru the air. Get more control and a slower WGT swing meter with the new Nike RZN White Vapor golf balls, with matching white vapor trail. 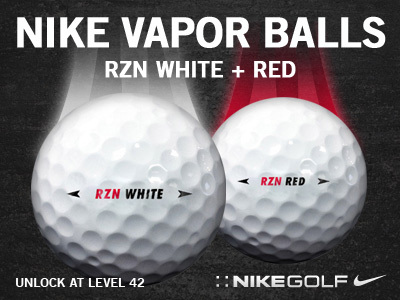 Get more distance and a slower WGT swing meter with the new Nike RZN Red Vapor golf balls, with red vapor trail. 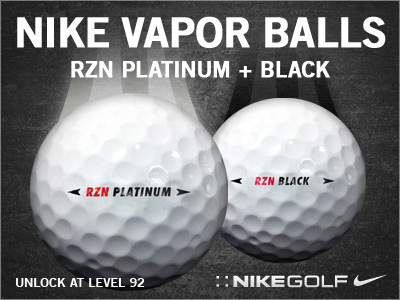 Get even more control and a slower swing meter with new Nike RZN Platinum Vapor golf balls, with platinum vapor trail. Get even more distance and a slower swing meter with the new Nike RZN Black Vapor golf balls, with black vapor trail. All new RZN Vapor virtual golf balls are available now in the Pro Shop. Brackets are the fastest growing new game on WGT. Players compete in small 16-person brackets in head-to-head match-ups, with winners advancing until a final champion is decided. Country Clubs can run private Bracket tournaments too, initially stroke play and now closest-to-the-hole private tournaments for their members. Set one up today on Pebble Beach or Wolf Creek. If you haven't joined a Country Club yet, get in on the fun. This is a great way to make new WGT friends and always have a group to play and compete with. It's easy to find one looking for new members, or create your own! Get the most distance and control in the game from NIKE RZN. 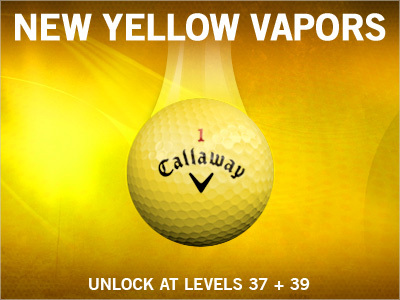 By popular request, the player-favorite Callaway HEX Chrome virtual golf balls are now available in yellow, with matching neon yellow vapor trails. Help trace your shots thru the air and your putts over breaks. 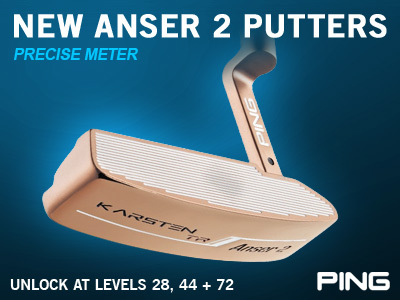 The PING virtual putters on WGT just got an upgrade to the latest PING Answer 2 putter with a more precise swing meter. Drain more eagle and birdie putts! 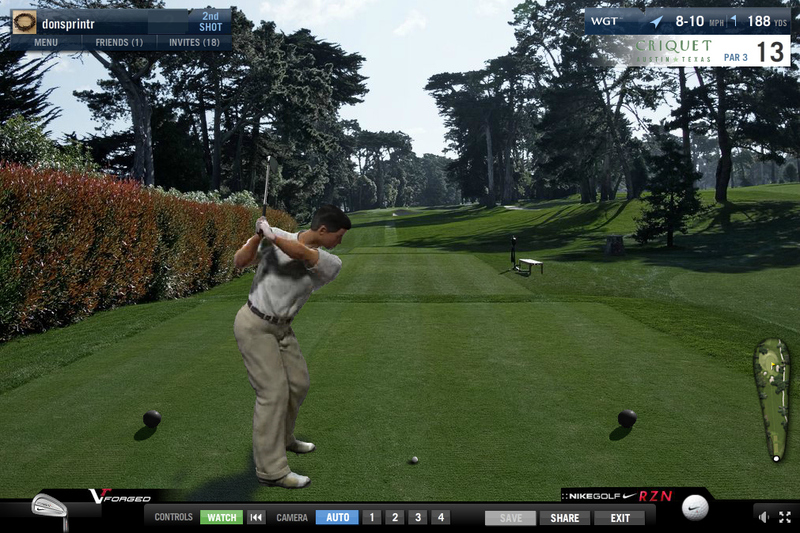 Most WGT players are also real-world golfers, so you can now book your real-world golf right from WGT. 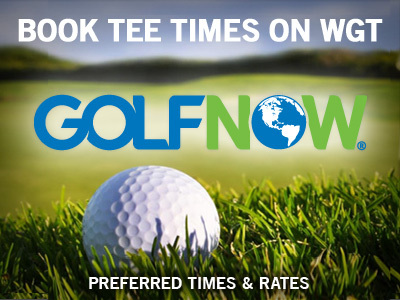 The new service is powered by WGT partner GolfNow, the world's leading online booking site for discounted golf rates at over 5,000 golf courses in the USA, Canada, UK and other countries. You'll find preferred rates on great courses, including some of the virtual golf courses from WGT, like Bali Hai, Edgewood Tahoe and Wolf Creek, depending on the season. A slower WGT swing meter makes it easier to "ding" more shots. Try these premium virtual golf balls that will slow down your WGT swing meter and help you hit better shots. Use WGT Credits to purchase premium golf balls. Get WGT Credits by leveling and tiering up, completing free offers and purchasing WGT Credits. The June stop on the WGT Virtual Tour is shaking up the leaderboards with a challenging "Best of Par 3" composite course. It features all par-3 holes from championship courses and creates a layout that favors players with accurate irons and putters. There are new names on the leaderboard at the Criquet Cup. Currently leading the Tour Legend tier is Argentina's Tordodam with a 37 on the par 54 course, and following close behind are BolloxInBruges, AllyKennedy, fmagnets, poldimaier, cadaviar, xXxxMARCxxXx and Wontonamo, all with 38 in Round 1. The top season leaders in the Tour Legend tier are also still in the hunt: dansamcam with 38, CptWomp with 39 and FrenchConnect with 41. Round 1 of the Criquet Cup ends June 25, and Round 2 is June 26-30. The 2014 Virtual U.S. Open Qualifier ends on June 30th. There's still time to post your best round on Pinehurst No. 2 for your chance to win the grand prize trip to next year's U.S. Open. Both the top leaderboard score AND one other lucky player chosen at random will each win a grand prize trip for two to Chambers Bay as special guests of the USGA, plus a $500 USGAshop.com gift card. And everyone who enters the Qualifier gets a free USGA avatar, a free Lexus virtual golf ball, and a free Lexus Putter Pal. Special week-long stroke play tournament on Pinehurst No. 2 during the U.S. Women's Open. Both the top combined leaderboard score and one other lucky player chosen at random will each win a $500 USGAshop.com gift card. Post your best Round 1 stroke play score by Friday 6/20, and then your best Round 2 score from Sat 6/21 to Sun 6/22. *Tournament is free to enter for WGT players in all countries. See rules for eligibility. You watched the men take on the Pinehurst No. 2 golf course last week, now it's the women's turn in the U.S. Women's Open Championship. 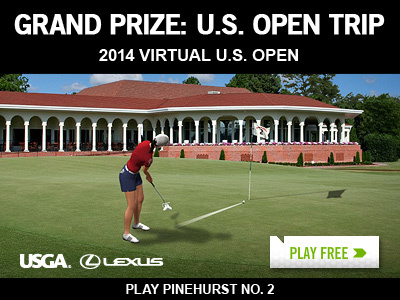 NEW this year, play this special week-long tournament during the U.S. Women's Open on Pinehurst No. 2 for your chance to win a $500 USGAshop.com prize. Post your best Round 1 stroke play score by Friday 6/20, and then your best Round 2 stroke play score from Sat 6/21 thru Sun 6/22. Both the best combined score and a lucky sweepstakes winner each get $500 USGAshop.com gift cards. 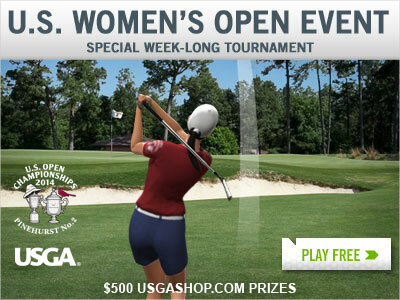 This Qualifier tournament is the main event of the 2014 Virtual U.S. Open tournament, with a chance to win a dream grand prize trip to the 2015 U.S. Open at Chambers Bay. It features all 18 holes of stroke play on Pinehurst No. 2, including all the challenges you'll see play out in real life throughout the week. When you enter to play free, you get a USGA avatar, a Lexus virtual golf ball and Lexus Putter Pal to help you improve your putting in the game. It's U.S. Open Week and play is underway at Pinehurst No. 2, so we're previewing the final holes of the famed course and host of the 2014 U.S. Open Championships. The fairway on the finishing hole at Pinehurst No. 2 is much narrower than it appears from the tee box. Players should avoid the deep fairway bunker that runs down the right side of the fairway and another tricky bunker that sits to the short, right side of the green. After missing his tee shot in the right rough, Payne Stewart saved par on this closing hole to win the 1999 U.S. Open. 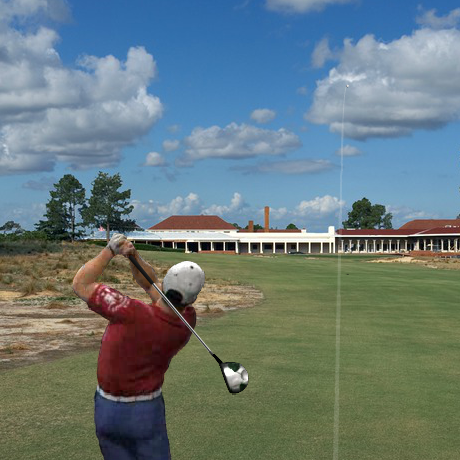 Play the 18th at Pinehurst No. 2 free without sign-up on WGT. If you haven't played WGT yet, join millions of other virtual golfers playing free online at wgt.com. New this year, play this special week-long stroke play tournament on Pinehurst No. 2 while you watch all the U.S. Open action unfold at the real course. 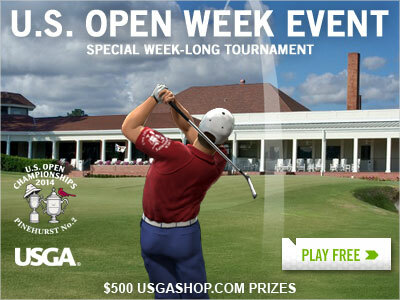 The U.S. Open Week Event on WGT is free to enter, with two $500 USGAshop.com gift card prizes up for grabs. Both the top combined leaderboard score and one other lucky player chosen at random will each win a gift card. Post your best Round 1 stroke play score by Friday 6/13, then your best Round 2 stroke play score from Saturday 6/14 to Sunday 6/15. *Special tournament is free to enter and open to WGT players in all countries. Round 1 runs thru Fri 6/13, Round 2 runs Sat 6/14 - Sun 6/15. See rules for eligibility.